Of all the rooms in a home, bathrooms are my all time favorite to design, and this one was no exception! I started by completely reconfiguring the space to maximize the size of the dressing and closet area. 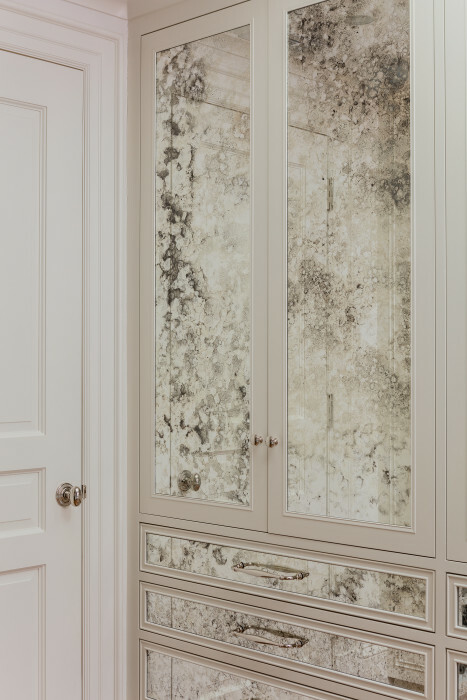 The dressing area has beautiful, custom cabinetry with inset antique mirror on the door and drawer fronts. In the bathroom itself, the custom designed walnut millwork and cabinetry is highlighted with burled door fronts and is finished off with gorgeous polished nickel decorative hardware. 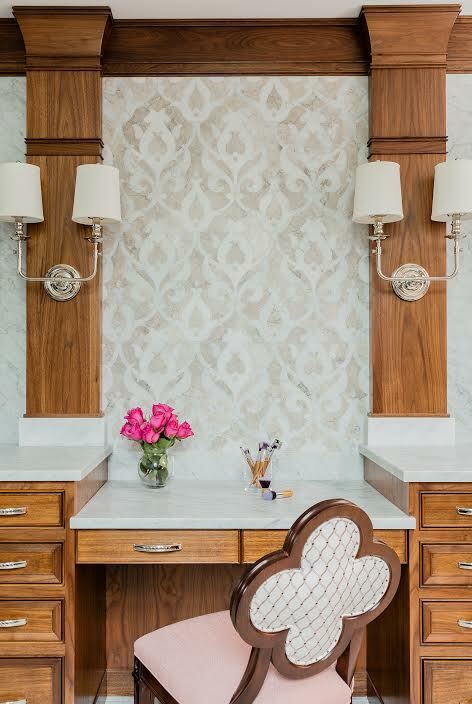 Detailed marble and tile steal the show in this design. Classic cararra marble is utilized throughout with an amazing mosaic as accent around the tub, over the makeup vanity and in the shower. Decorative marble mosaic details frame the marble floor of the space. Last but certainly not least — that tub! 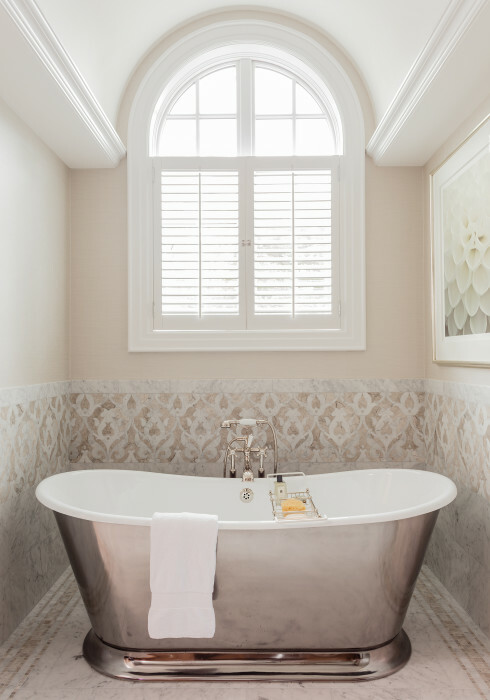 A gorgeous free standing oval cast iron bath with a burnished exterior offers the ultimate end of day retreat. Overall, this is a space where my clients will be able to prepare for the day and unwind in full luxury! I custom designed the textured metal built in. It includes thick star-fire glass shelving; door, drawer fronts and custom door handles covered with a faux ostrich vinyl fabric, and integrated LED lighting to highlight art and beautiful accessories. I then brought in equally fabulous furnishings to match: a glass table with a unique metal faceted base, acrylic chairs upholstered in a fun animal skin motif fabric and a contemporary chandelier created with layers of pink fabric. It’s hard to compete with the floor to ceiling water views of this living room, but I worked with creamy colors and decadent textures to create sophisticated drama in this beautiful space. Pops of playful jewel toned throw pillows enhance the low slung sectional sofa. A menagerie of textures — velvet swivel chairs, silver and grey shag area rug and a high gloss cocktail table with a shiny, mirrored tray — add comfort and visual appeal to the space, while a more traditional oversized mirror balances the space. Finally, we opted for bold but simplistic artwork that allows the focus to stay on that incredible view. Though both award-winning designs are quite different stylistically, they capture what I love most about being a full-service interior designer. In both spaces, I worked closely with my clients to create spaces with elegant custom features, delicious layers of color and texture, and luxurious style. If looking at these designs makes you crave a fabulous new living room, dining room, or bathroom of your own, I don’t blame you! To schedule a consultation to discuss an upcoming project, please reach out to me at lesliefine@lesliefineinteriors.com or 617-236-2286.